So, you’ve decided you want to start creating dashboards? Great! Dashboards are the perfect way to visualise your most important KPIs and also motivate your team to achieve great results. Before you embark on your dashboard design journey, there are a few things you need to think about first to ensure you have a seamless transition. Keep reading to discover the five most important things we think you should bear in mind before you start designing dashboards. The first thing to consider is who exactly your dashboard is going to be seen by, or in other words, who is the target audience? This is really important as different people in your company will have different things they are looking for in a dashboard. For example, an executive dashboard designed for your CEO or your board will need to be easy to understand as they may not be familiar with working with dashboards on a daily basis and are not used to seeing data presented in this way. The placement of your dashboard will have a huge effect on how well-used and valued your dashboard is. If you have TV screens in your office, then you already have the perfect place for your dashboards! Here at Plecto, we have at least one TV screen placed near each department so that only relevant KPIs are being displayed to each team. However, having only one TV isn’t a problem, as with Plecto as you can display your dashboards as a slideshow so that every team gets to see their dashboards. If you don’t have any TVs at all then Plecto also works perfectly well on a laptop, or on a tablet or a phone! If you’re building a dashboard for a common area, you could choose to put the most important KPIs from every department on it so that anyone who sees it can instantly get an idea of how things are going across the whole business. This is also a really nice touch if you have a reception area with a TV screen as you’ll be able to show off your great performance to visitors! We have spoken in our other dashboard design blog posts about the importance of having a well-designed dashboard in order to get the best out of your dashboard experience. Your dashboard needs to be uncluttered, easy to understand, use color and also have the most important information in the top left, as this is where the human eye naturally begins reading from. It’s also a good idea to use the most appropriate widgets for the type of data you are trying to display. For example, pie charts are not good to display more than two data categories as they are hard to understand at a glance. Bear in mind what you want the key takeaways from this dashboard to be. Design your dashboard in such a way that the viewer will instantly get the complete picture. What’s your most important KPIs? As the aim of a dashboard is to keep it as easy to understand and digest as possible, you should only pick your most important KPIs to display. One way to narrow down your important KPIs is by deciding which ones are actionable. Actionable KPIs are ones that employees can influence and change. Showing these types of KPIs is important because employees will be more motivated to influence them if they believe they have the power to change them. Also, consider what you want the outcome of the dashboard to be. To use an example from a marketing department, if the goal is to drive more conversions on your website then a marketing dashboard should primarily be dedicated to displaying your lead funnel and your conversion rate figures. Although using a dashboard to display data is great because it will automatically update, there should be a nominated person in your company who will be responsible for adding new widgets, or making design changes. If IT is expected to help out then they need to be aware of this and become familiar with your dashboard system. If you are relying on employees inputting manual data into your system, then ensure they’re familiar with this process so that you are getting accurate data into your dashboard. 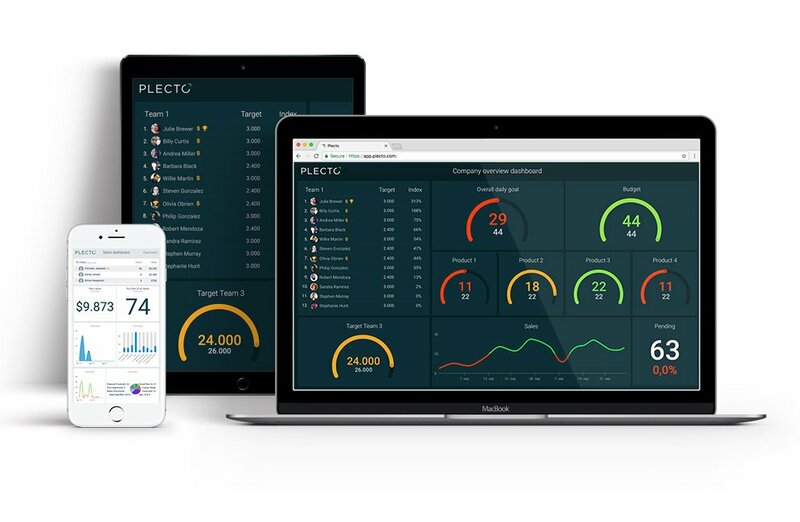 Plecto is a dashboard software that motivates and engages your team, as well as displaying your most important KPIs. To get started with your 14-day free trial, simply enter your email address below.